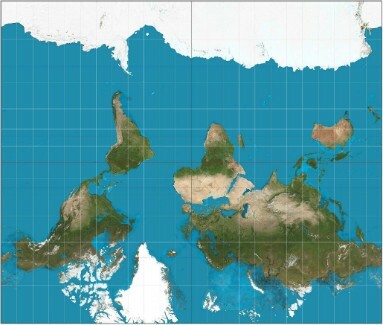 Did you know that all world maps are distorted? Why is North always at the top? Why is Europe at the centre? In recent years ‘multiperspectivity’ has become a commonly used term in various school curricula. Stradling (2003) pinpoints the following characteristics of multiperspectivity: “it is a way of viewing, and a predisposition to view, historical events, personalities, developments, cultures and societies from different perspectives”. He adds that there are two important preconditions to multiperspectivity, namely: “a willingness to accept that there are other possible ways of viewing the world than one’s own and that these may be equally valid and equally partial” and “a willingness to put oneself in someone else’s shoes and try and see the world as they see it, that is, to exercise empathy” (p. 13). What is included and what is left out from this point of view? Vella (2015) claims that “It is difficult to uproot one strong paradigm and replace it with another especially when there is a strong emotional investment behind one or the other” (p. 399). Often, the stories we are brought up with in our informal socialisation are prejudiced and stereotyped (Byram, 2007). It is not easy for us to accept other versions and perspectives that question what we assume to be ultimate truths and it is for this reason that multiperspectivity should play such an important role in our teaching. Maps can be, and are used, across the curriculum and they offer us plenty of opportunities to enhance multiperspectivity. Using maps that reflect different perspectives in our teaching is one way of helping our students develop skills of observation, interpretation and decentering. Who decides which country should be at the centre of the world’s surface given that the world is spherical? Which countries are considered to be part of ‘the western world’? Where is this notion coming from? Given the challenge of representing a spherical planet on a flat surface, all map projections are in one way or another distorted. This is inevitable. Students can appreciate this in a mathematics class by trying to peel an orange and then flatten the peel. Is it possible to get a perfect rectangle without tearing the peel? Chances are that the best they could get is something close to what is referred to as an ‘Interrupted projection’. Given that getting a perfect rectangle is basically impossible, how is it possible to portray a spherical world on a rectangular flat map? The latter has been the biggest challenge for cartographers ever since the first attempts to represent a round earth on a flat surface! As much as a globe is the only way one can represent all the geographical relationships without distortions, having flat maps is convenient. 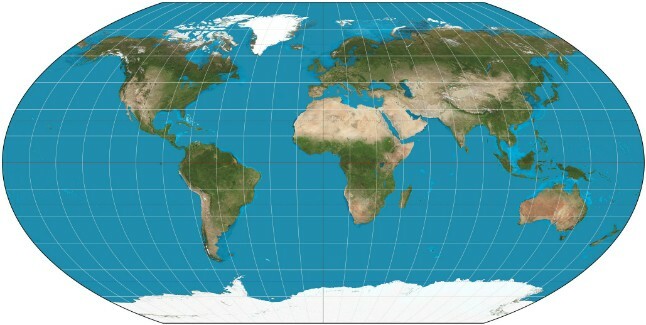 The problem does not lie in using flat maps, but rather in the fact that the distortions or biases are not made clear to the person using the map. Is it explained anywhere in an atlas that there is a distortion of angles, directions, shapes, distances or areas? Every map projection has its strengths and weaknesses, and which map to use should depend on the reason for using it. The shape of world maps has varied considerably in the history of cartography including such shapes as hearts and cones. However, this diversity is not commonly encountered and many of us expect the shape of a map to be rectangular with a very specific representation of the continents, with Europe at the centre and north at the top of the page. This is because of our constant exposure to the Mercator projection which was created by a Flemish cartographer in 1569 but is still the most common world map today. For many of us the Mercator map is the world map. Try to ask a group of students or teachers to sketch a world map from memory. Chances are that they will all reproduce the same representation of the world! … why is this so? 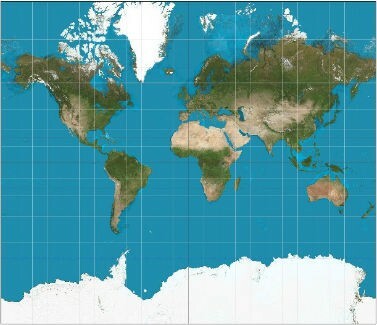 The Mercator projection is ideal for navigation purposes since it shows accurate directions. It also gives the right shape of countries. However, this comes at a cost. Sizes are distorted in favour of northern countries. So for example, looking at a Mercator map one would think that North America is larger than Africa but this is not the case. Scandinavian countries look bigger than India when in actual fact the latter is three times the size. Is it merely a coincidence that Europe is at the centre of the map and looks much bigger than it is in reality and that north is put at the top? The fact that north is put at the top is mere convention. For example, in medieval Christian maps east was at the top. This is because of the belief that the Garden of Eden and the world emanated from east. Islamic maps of the same period put south at the top due to the orientation of Mecca. It very much seems that the reasons for distortions are not mere technical ones and that the reasons for showing maps from a particular perspective are not mere coincidences but that there are ideological underpinnings behind them. Why would cartographers (mapmakers) want us to look at the world from that particular angle? As educators we need to question what we tend to take as natural or objective, and instil in our students a sense of inquisitiveness. Along the years there were many cartographers who created alternative representations of world maps, each with its distortions. The Peters projection, developed by a German historian and journalist in 1973, gives us the accurate sizes of countries. It is maybe one of the most stimulating and controversial projections. 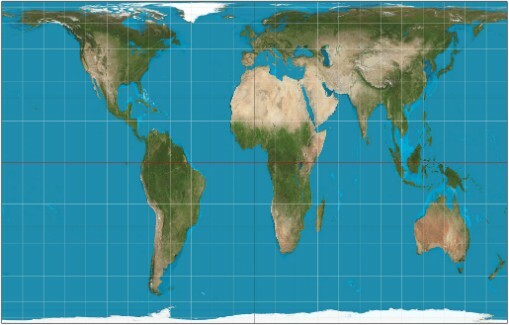 Although the cost of showing accurate areas is the distortion of shapes, this projection clearly shows, for example, that the size of Africa is much larger than what we were always made to believe! In order to help students visualise the world from a different perspective you might want to show them an upside-down map or a map that does not place Europe at the centre. The visual impact is quite strong and it makes you realise the influence that traditional maps have had on the way we view ‘the world’. Why do “different” maps look so strange to us? What impact do world map representations have on the way we envision global territory and power relations? An interesting cross-curricular project would be to look at the way Google Maps, the search engine that dominates cartography in today’s world, represents the world! Interactive maps are now accessible by anyone who has access to a mobile device with an internet connection. What is included on maps of cities, towns and countries and what is excluded? How does the fact that Google Maps is driven by advertising revenue affect what it includes on a city map? James Wan (Senior editor for Think Africa Press- same link as in Footnote 1) encourages us to try and imagine what it would be like if Google’s data and programming ability were to fall in the hands of a Namibian agriculturalist, a Sahelian nomad or a Senegalese fisherwoman. Soil types and water quality would certainly be given more importance than the closest Starbucks outlet! These links include information about different map projections and the power of cartography, as well as maps from different perspectives. Stradling, R. (2003). Multiperspectivity in history teaching : a guide for teachers. Germany: Council of Europe Publication. Vella, Y. (2015). What should history teachers do when historians do not agree? Malta Review of Educational Research 9(2), 397-403. Marvic Francalanza has been teaching Mathematics in Malta at various levels for the past 17 years. She is passionate about culturally responsive teaching, and opted to further her studies in this area. She is a United World College alumna and has been doing voluntary work for UWC Malta since 2000. She was a participant in the Pestalozzi Programme Summer School of the Council of Europe entitled ‘Competences for a democratic culture: from onlookers to engaged and active citizens’ in 2017. She describes this experience as a very powerful one on a both personal and professional level. This experience helped her take a step back and reflect on the lenses through which she views the world in general, and teaching in particular. She strongly believes that raising one’s cultural self-awareness is crucial to be able to become more interculturally sensitive and a more powerful teacher.